The KSLS Charitable Foundation provides scholarships for students in an undergraduate surveying program. For further information and an application, please contact the Foundation Executive at Foundation@ksls.com. The TrigStar Program Contest is an annual high school mathematics competition sponsored by the National Society of Professional Surveyors based on the practical application of Trigonometry. The program recognizes the best students from high schools throughout the nation. 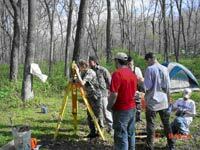 The Kansas Society of Land Surveyors annually purchases a site license to sponsor this program in Kansas. The Boy Scouts of America was incorporated on 08 February 1910 and Chartered by Congress in 1916. Its stated purpose is to: “Provide for boys and young adults an effective educational program designed to build desirable qualities of character, to train in the responsibilities of participating citizenship and to develop in them personal fitness. The Kansas Society of Land Surveyors (KSLS) Board of Directors officially formed a Boy Scout Merit Badge Committee in July 2004, however, many surveyors across Kansas have been actively involved in teaching the Surveying Merit Badge requirements for many years. The Kansas GLO Project was started at the instigation of Fran Lopata of Little Rock, Arkansas who forwarded a set of GLO Notes on CD-ROM for the state of Arkansas to her son, a Kansas land surveyor. A native Kansan, she asked if Kansas had the same kind of information and when the reply was "no," she wanted to know "Why not?" 1.) NSPS Board of Directors requests that the Board of Directors for each state society formally endorse the NSPS Geocaching Program and request statewide volunteers to assist with program implementation. 2.) Geocaching sites that are part of this program must be established on public grounds and be in compliance with all regulations posted by www.geocaching.com and by the responsible governmental unit. Parks are ideal sites, but each Park system may have different regulations as to whether Geocaching is permissible. 4.) Criteria for establishing coordinate values, describing cache site, and posting on website are as follows. a) Select a Society Coordinator to a establish a Geocaching site at http://www.geocaching.com. b) Determine what your cache containers should be. c) If possible choose locations that have some significance to surveying ( meridians, guides, benchmarks) or historical events (Pony Express station, historic trail, interesting rock formation). “Hide” without disturbing the environment, double check the coordinates, give the site a name, inform the local coordinator. d) When a cache is set, the surveying society’s coordinator will enter the name of the cache and the coordinates on the Geocaching website. Before the site is actually published, i.e., allowed to be listed on the web, a State Coordinator for the national Geocaching organization will check to determine if there are any conflicting sites nearby. (Note: Every state has a volunteer who acts as a clearing house for the national organization) If there are no conflicts, the site will be approved and listed on www.geocaching.com). e) When your cache locations have been established, your society's coordinator should contact Ernie Cantu, LS, at geocacher@sktc.net (the Kansas Geocaching Coordinator, who has agreed to be the NSPS coordinator for project). Ernie has already created a NSPS folder with subfolders for each State Affiliate at www.geocaching.com. After being contacted, Ernie will connect the link so that all state caches will be listed under the NSPS Geocaching site as well as the State’s site. Currently, Kansas is the only highlighted link on the NSPS Geocaching site.